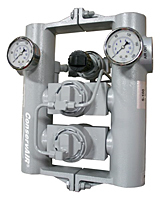 ConservAIR is the concept of controlling the demand side of a compressed air system, utilizing an Intermediate Control® flow device. An Intermediate Control® monitors and stabilizes air pressure by adjusting flow. The l/C releases air from storage to maintain a continuous, optimal air pressure supply. The result of using ConservAIR is reduced waste from leaks and constant air for production.